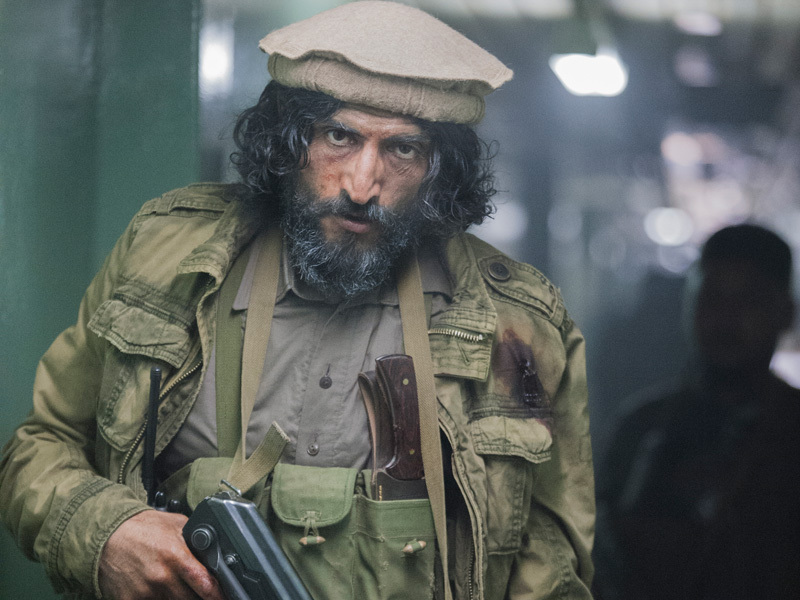 Instead, “Homeland” this season joins the ranks of shows like Marvel’s “Agents of S.H.I.E.L.D” that got a slow start establishing characters and broad arcs rather than diving right into the meaty stuff. When things finally revved up, the show’s different pieces (Carrie and Saul, suspense, tense action sequences, secret plots, etc.) began to fit and work together cohesively. Both shows are an object lesson in why you put your best stuff up top. That forces you to do something even better after that! This week’s episode is actually a great example. We jump in right where we left off last time. Carrie and Saul are pinned down and under fire in the middle of the street. Quinn and company back at the embassy have only a few moments to prepare for an imminent invasion by Haqqani and his people. It’s tense, it’s crazy, and it’s pretty great. One particularly shining moment shows Carrie unable to switch her brain off, dodging bullets and simultaneously trying to work out Haqqani’s bigger plan. So, that’s the first half of the episode. Quinn and another one of the few remaining soldiers at the embassy avoid capture after the initial attack, while Lockhart, the ambassador and a handful of others manage to lock themselves down in a panic room. Haqqani’s after a list CIA sources, and Lockhart eventually caves under the threat of brutal, on-tape executions and hands the list over, but not before one of this show’s best and most underutilized characters, Farah Sherazi, is killed. That scene in particular was very hard to watch. Haqqani kills three people before Lockhart crumbles, and right up to the point he surrenders, the show does a great job putting us in his head. He has to watch this happen on a screen, just like we do, and we know he could stop it. But it’s crazy that A, he does, and B absolutely no one stops him. This show has repeatedly posed Big, Grey Decisions to its characters (Carrie held Saul’s life in her hands at least twice), and some were greyer than others, but this absolutely was not. There is no way anyone should ever hand over that list. It’s unconscionable, and while I can maybe get behind Lockhart, who’s already played the semi-antagonist, maybe making that decision, it’s totally nuts that nobody in that room — people who work for the CIA — aside from the ambassador speak up at all, let alone try to physically stop him. Even crazier, there wasn’t any fallout for Lockhart after Haqqani escapes. He’s sad and resigned, but so is everybody. He just committed the worst sin a spy can, and Carrie, who I hope just didn’t have the energy not to lie, let him off the hook. Still, that’s the kind of shout-at-the-TV complaint that can make an episode more fun to watch, not less, or at least not interfere too much with all the other crazy things that are going on at the same time. Haqqani does escape, though, so we get to take a breath. Everyone is depleted, demoralized and scared. Quinn and Carrie clash over what to do next. Carrie doesn’t seem to have the energy to contemplate sticking around without support from the White House and president (who is closing the embassy down and severing diplomatic relations), but Quinn wants to find Haqqani before he disappears again. Eventually, of course, Carrie comes around, so we’re looking at a finale in two weeks focusing in on Quinn and Carrie, their turbulent relationship, and more likely than not, some more violence. I’m looking forward to it. I’m looking forward to next season too. “Homeland” worked really hard for a long time this season to seem like a show that can’t better itself, but it obviously can. I want to know how much.